Promoters, or the majority shareholder group, of a company generally pledge their shares as collateral to raise funds, which can be used either in the same business or outside. Pledging of shares by promoters of companies listed on the National Stock Exchange rose to the highest level in seven years in the quarter ended 31 December, according to data compiled by capital markets tracker Prime Database. 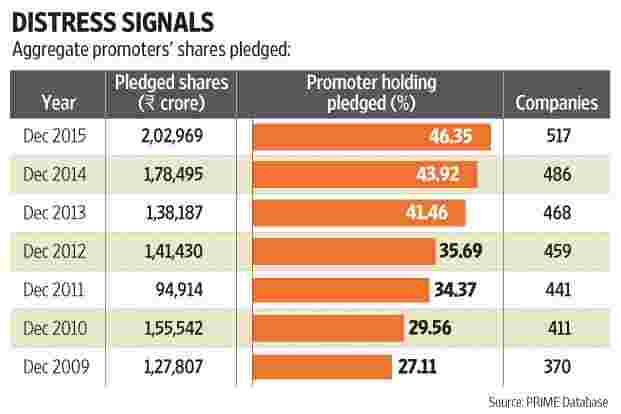 Promoter share pledging rose 14% in the last quarter of 2015, with the value of pledged shares increasing to ₹ 2.03 trillion as on 31 December from ₹ 1.78 trillion a year ago, data showed. “Given the fall in equity markets, this points to a high level of financial distress," Pranav Haldea, managing director of Prime Database, said in a release. The number of NSE-listed companies where promoter shares have been pledged has gone up from 370 six years ago to 517 as on 31 December. During this six-year period, the percentage of total promoter holding pledged has gone up from about 27% to 46%, with the value of pledged shares going up from ₹ 1.28 trillion to ₹ 2.03 trillion. “High pledge levels are typically not considered a good sign by investors as a downturn in the market price can lead to invocation and change in management. Surprisingly, there were as many as 25 companies in which the complete holding (100%) of the promoters was under pledge as on 31 December 2015," said Haldea. Some of the firms where all of the promoter shares have been pledged include IVRCL Ltd, Pipavav Defence and Offshore Engineering Ltd, Gokaldas Exports Ltd, IL&FS Investment Managers Ltd, Ankit Metal and Power Ltd and Bajaj Hindusthan Sugar Ltd. There were as many as 79 companies in which more than 90% of the promoters’ shareholding was pledged and 208 companies in which more than 50% of the promoters’ shareholding was pledged, data from Prime Database points out. The December quarter also saw promoters of several firms pledge a significant part of their holdings from zero earlier. JMT Auto Ltd saw pledged shares grow to 93% at the start of the quarter, while others such as Bedmutha Industries Ltd and Khaitan Electricals Ltd saw pledged shares grow to 50% and 42%, respectively, of promoters’ holding. Overall, there were 82 companies in which the percentage of promoter holding pledged increased in this period. However, some promoters were also able to bring down the quantum of pledged holdings. Promoters of firms such as Mangalam Cement Ltd (52% to 0%), Ashapura Minechem Ltd (36% to 0%) and Tree House Education and Accessories (43% to 12%) successfully pared their pledged holdings. The quarter saw nine companies reduce the quantum of pledged shares to zero. The largest pledge creation transaction in this quarter was that of SB Adani Family Trust, promoter of Adani Ports and Special Economic Zone Ltd, pledging 76 million shares to IDBI Trusteeship Services, the value of the pledged shares being ₹ 2,459 crore. In all, shares of promoters of 115 companies were pledged during the September-December period.